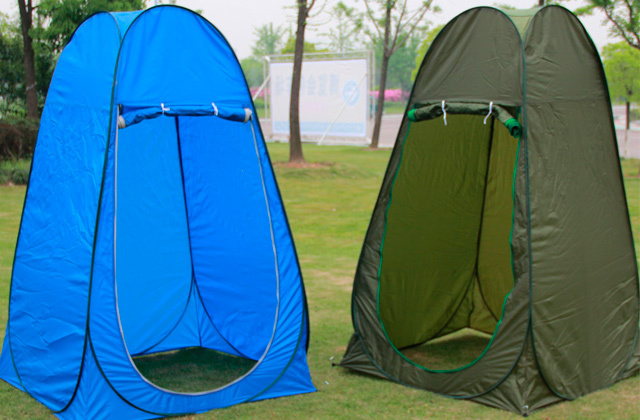 The canopy protects you against the sun’s rays but you can remove it when indoors. A 2-inch-thick foam-filled PVC-coated polyester cushion provides comfortable rest. The whole construction is quite heavy for transportation. 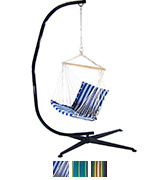 With this hanging lounger, you’ll be certain to feel comfortable, it seems to whisper: "Lie down and rest." Those who prefer quality will really appreciate it. 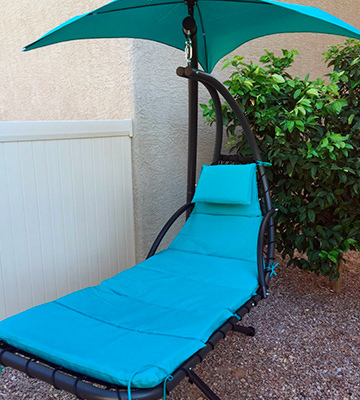 This stylish, reliable, and comfortable swing chair gives you a chance to relax and recover as if you are swaying on the waves. 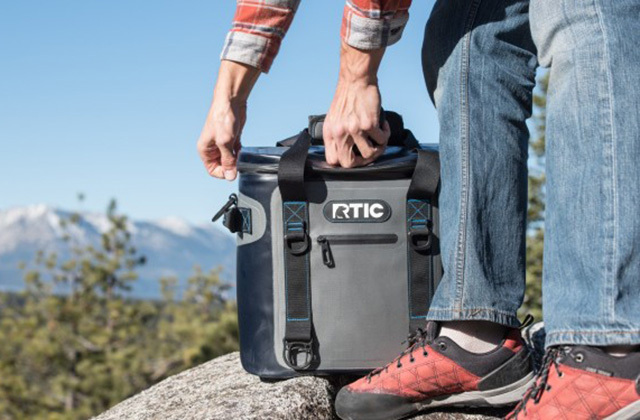 It takes up a minimum space when folded, and the bag in the kit allows easy transportation even in your backpack or sports bag. Bright colors may fade quickly in the sun. A bright and cute chair will not only decorate your backyard but also create a cozy place for unforgettable rest. 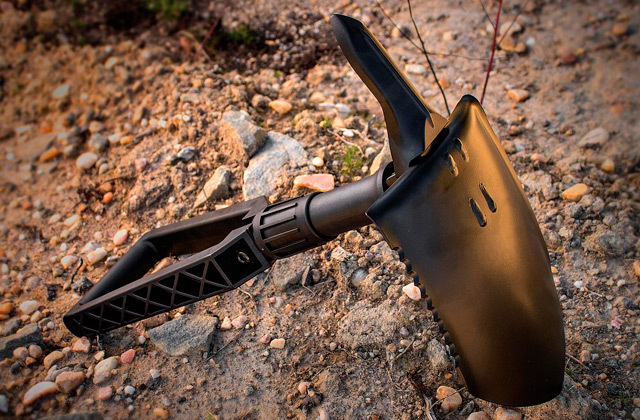 Lightweight and durable at the same time. It will make you forget about the hard day at work and everyday problems. Two removable large cushions provide maximum comfort. Might be somewhat uncomfortable for tall people (6'5" and taller). It is undoubtedly the chair of utmost comfort. Children or adults alike will be very satisfied. After some rest in this chair, you will be full of energy. There is a nice removable footrest for enhanced relaxation. The stand consists of 2 parts joined in the middle, it might get loose over time. 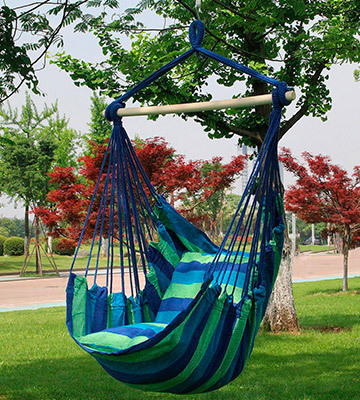 If you can not make up your mind between a hammock or a garden chaise longue, buy this hammock chair and enjoy the beauty of your garden and nature. You can place a small firm stand and a spacious chair indoors as well as outdoors. 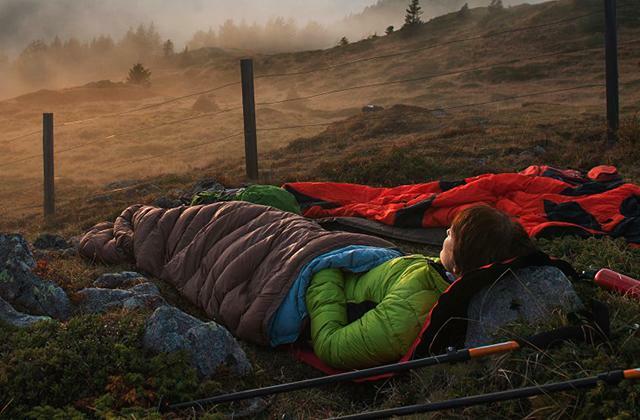 Polyester makes the hammock more durable and resistant to any weather. Imagine yourself on a tropical island among coconut palm trees. 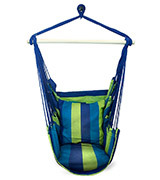 This chair is a classic hammock of woven ropes, strong and durable yet compact; it is convenient to take anywhere you go. Modern design and reliable materials are what make this chair-swing the leader in terms of comfort. It stands out for its style. This garden chair is so bright and catchy that nobody will remain indifferent. It seems to float in the air, creating the feeling of weightlessness. 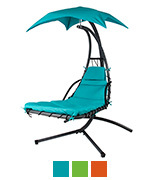 The chair also offers a removable umbrella to protect you from sun and heat. And if you are willing to sunbathe, just remove the umbrella! This item comes in three colors, you will definitely like one of them. Also, look at the materials. The frame is made of strong thick steel pipes providing great steadiness. The powder coating guarantees weather resistance for many years. 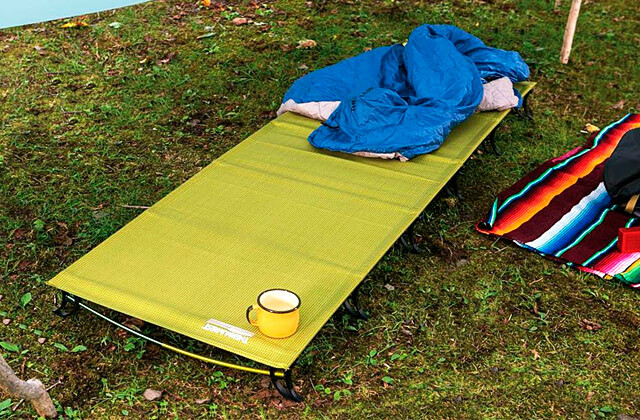 The hammock chair has reliable hooks that can withstand the weight of 265 pounds. There is also a removable mattress with a foam-filled headrest, it will add to the comfort and support your back. Finally, it is perfect to relax and take your mind off of daily problems. This swing chair will give you an incredible feeling of flying as if you are soaring or a yacht is carrying you on the waves. You can even fall asleep in it. 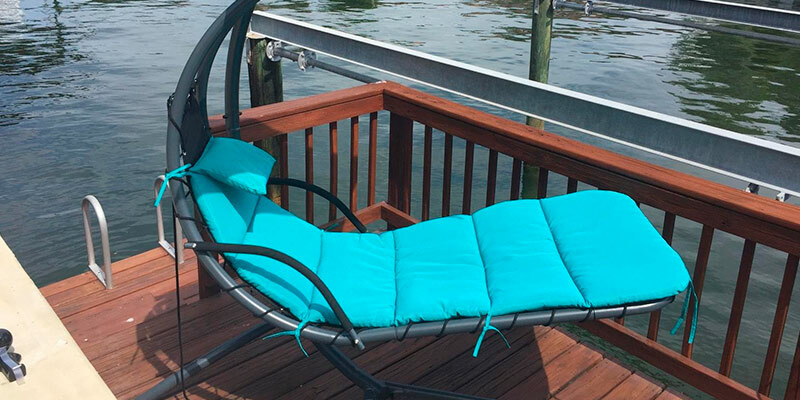 Effortless attachment is a great advantage of this hammock chair. It is perfect if you do not like wasting your time and wish to do things quickly. 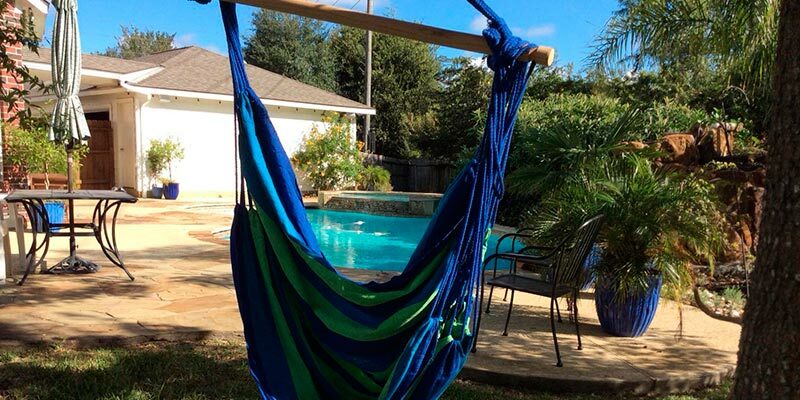 Unlike some conventional hammocks, this one does not need any stands. The chair can be hung to any crossbar or tree branch with a strong rope on a single central swivel hook. You can also take the chair inside your house or to a picnic, riverside, or lake. The set includes a bag, so you can fold the chair and transport it easily. 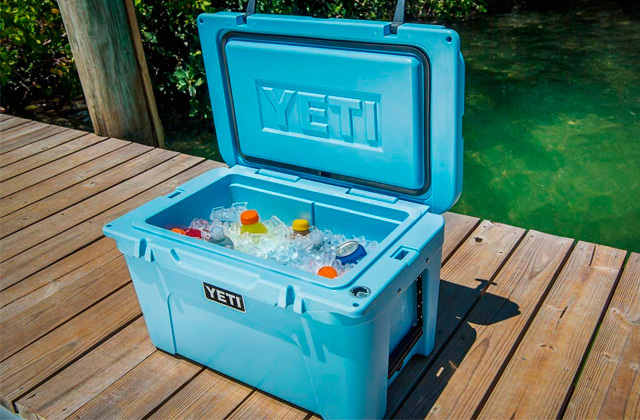 It will take up minimum space in your car's trunk, passenger compartment, or even in your backpack. 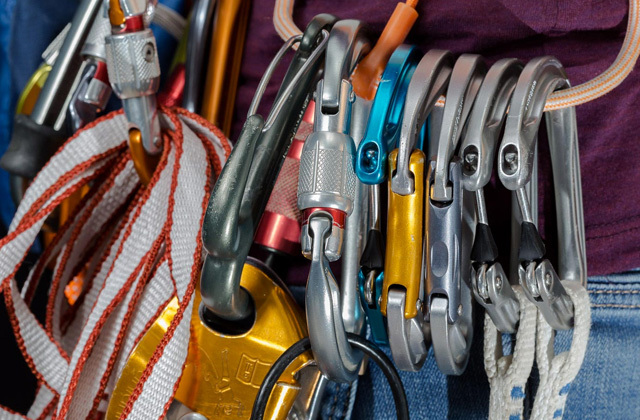 Reliable materials, a strong wooden strip, quality fabric, and cotton and polyester ropes provide a long service life. It weighs only 4 pounds but can withstand a weight of up to 300 pounds. This chair will help you unwind after a long working day, swinging and forgetting about your daily problems and rush. You could enjoy a book, chill out with your favorite drink, or just relax. What could be better than some rest after a hard working day in your backyard, especially if it is furnished properly? A hammock chair is a perfect option for comfortable rest in the open air or at home. The chair from the Sorbus company is made of cotton and polyester and its size is 40 x 50 inches (plus the ropes). 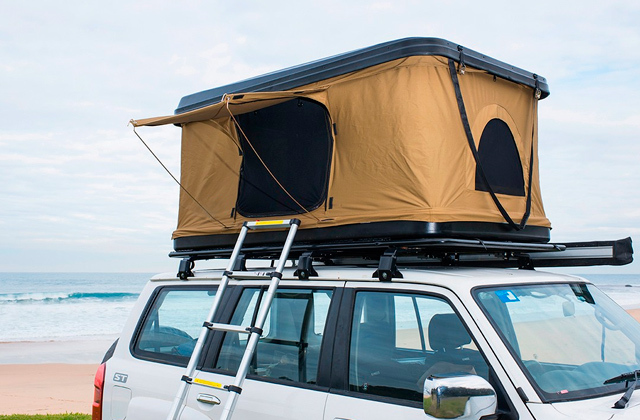 Moreover, the sturdy fabric holds up to 265 pounds. 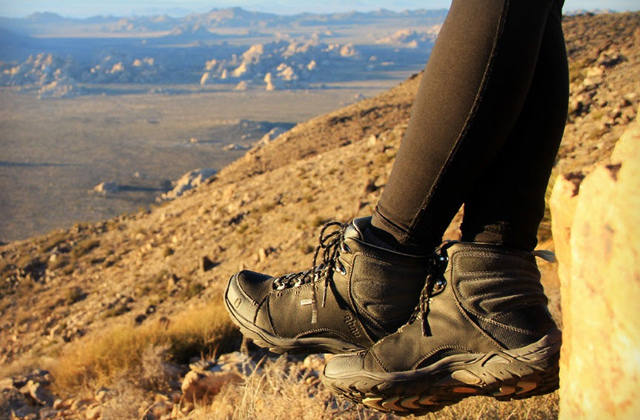 An adult of average body size (or even a bit of a plus size) can comfortably rest in it. 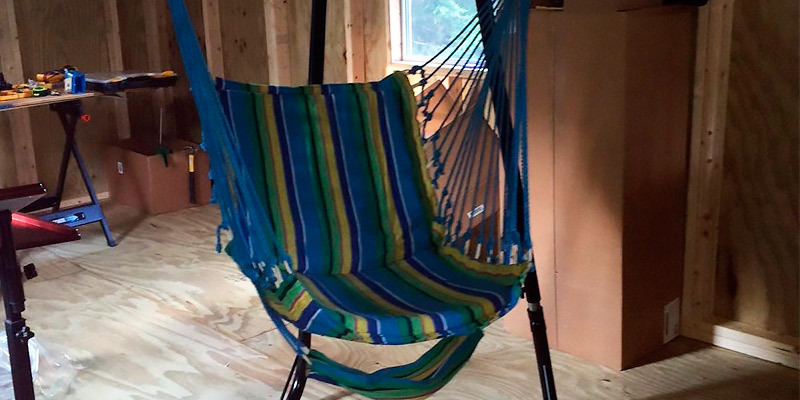 The hammock chair is hung on a single central loop and a rope on a tree branch or to a pre-mounted hook in the ceiling of your room or summer house. The fixture is reliable enough for you swing without any worries. The manufacturer thoughtfully provides two soft cushions for maximum comfort and back support. Each cushion is 17 x 17 inches in size. Sitting in such a soft and comfortable chair, you can forget about all your problems, work, stuffy transport, and overall frantic pace of life. Rocking a little in it will help you relax your tired mind. 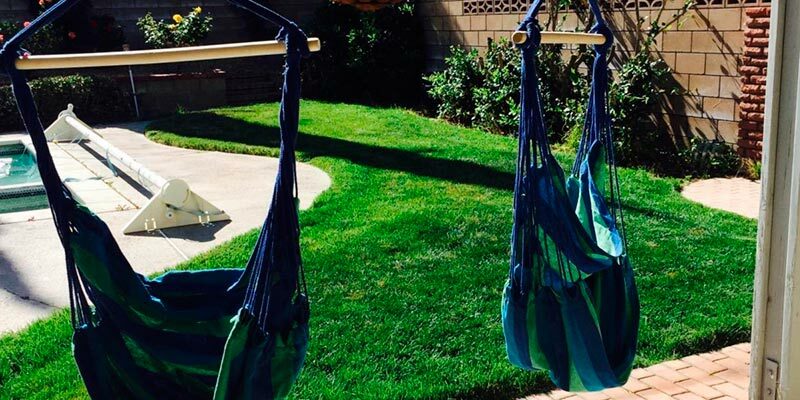 If you are confused about a wide range of hammocks, and you are looking for a comfortable summer seat so that you wouldn't have to rest on the ground or hard sunbeds, we recommend you to consider a hammock chair from Sunnydaze Decor. 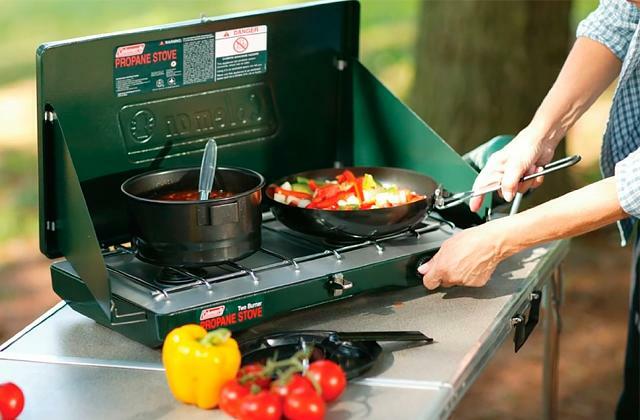 It will be an amazingly easy, compact, and environmentally friendly solution for your backyard. 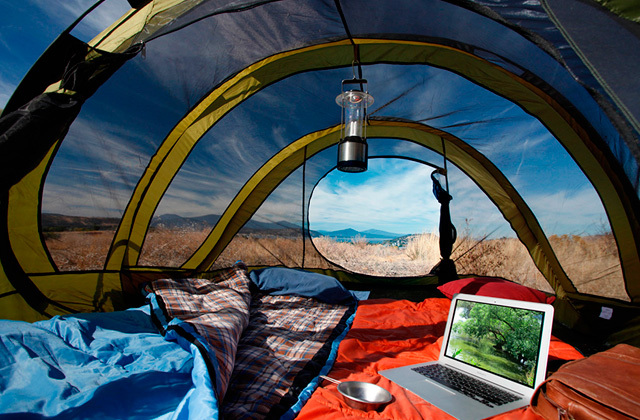 The model includes a metal stand with a suspended hammock. It is very steady despite the chair being attached to a single joint. Due to this construction, you can swing to and fro however you like. The stand is made from durable black tubular steel with a powder coating, providing resistance to various weather conditions. The chair itself is cotton with woven polyester ropes. 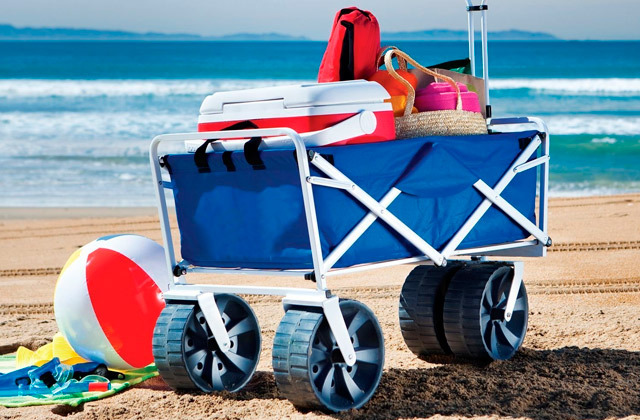 Its size without ropes is 44 x 26.5 inches and despite being very lightweight it can hold up to 300 pounds. A perfect hammock chair for an adult. It can be easily placed on your veranda, terrace, balcony or anywhere in your garden. You can also hang it on a tree without the stand. In addition, this model has the footrest. This solution allows you to sit comfortably as the blood flows from your feet back to your heart. 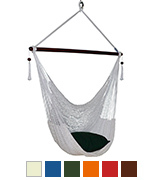 This hammock will help you achieve total inner peace, so important for everyone. Woven rope hammocks are classic. Looking at them we imagine living on a tropical island and enjoying breeze under the coconut trees. 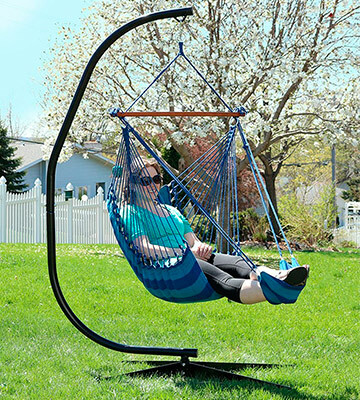 This hanging chair is created to help you enjoy rest after a hard day, or you can take it with you to a picnic and even on a trip. The chair comes ready-to-use. You just need a tree or a crossbar and the installation will take only a couple minutes. You can also mount it on a special stand (sold separately). It is possible to hang it in the yard, in the room, take it to the yacht, or place it on the balcony. Just find a suitable place for you, hang the chair there, sit comfortably and feel absolute safety and weightlessness. The chair is made of 100% polyester. The plus is that synthetic ropes are much stronger than cotton ones, they are resistant to many weather conditions and can be left outside even in the rain. In addition, polyester is less sensitive to mildew and fungi. If you have very soft skin, we recommend using an extra blanket or cushion. After relaxing in the Caribbean Hammocks chair you will realize what wonders a good rest can work. What is a Hammock Chair? Probably all owners of houses with a garden know how difficult it can be to create not only beautiful but also a cozy place to relax, especially if there is not that much space. As a rule, garden furniture is heavy and inconvenient when it comes to moving. Also, it can be rather demanding in terms of care. Hammock chairs are much better in this regard. They are a perfect alternative to any street chairs and chaise loungers. You can rest in it either sitting or lying. 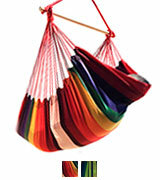 Unlike conventional hammocks, chairs are hung on a single support or stand which is sometimes even included in a set. Some models are so compact when folded that you can easily take them to a picnic and hang them on a tree with a rope. Swaying in a chair like this, you can relax and recover after hard working days. 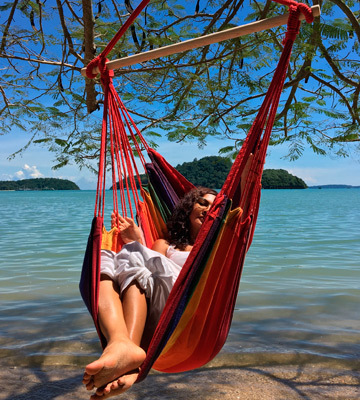 You could check out the hammocks reviews and choose a hanging bed for relaxation, a comfortable reading, and even sleep. And if there are no trees and other supports in your garden, then it is reasonable to look at hammock stands. 1. Katie Duzan How to Choose a Hammock Chair, Overstock. 2. HAMMOCK CHAIR DIY, A Beautiful Mess. June 2016. 3. 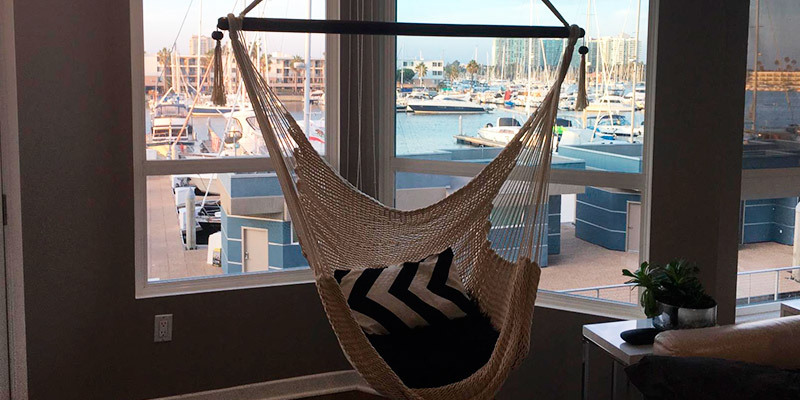 5 Interior Design Tips for Hammocks and Hammock Chairs, Dumb Little Man. November 24, 2016.